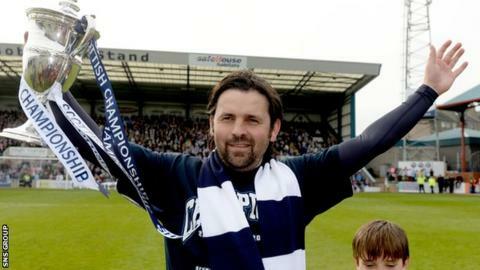 Manager Paul Hartley is preparing for a summer of upheaval as he readies Dundee for the top flight next season. "It's a rebuilding job to make sure this club stays in the Premiership," he told BBC Scotland. "We don't want to be a yo-yo club. "Over the years Dundee has suffered off the park but I think there is a bright future for us now. "That will take a lot of hard work. There will be a lot of movement - in and out." Having suffered relegation last term, Dundee clinched the Championship title on Saturday with a 2-1 win at home to Dumbarton, seeing off Hamilton by one point on the final day of the league campaign. There are loads of changes that I want to make and I'm sure the board will be right behind me. And that makes it three consecutive promotions for Hartley, who led part-time Alloa to the second tier before stepping down three weeks before he was given the job at Dens Park. "I want to try and build a team that's my team," added the 37-year-old former Scotland midfielder. "It's up to myself and the board to sit down and look at how we makes things better and how we stay in the league. "There will be hard decisions to make, choices that people won't like." Hartley inherited his squad from John Brown in February, with the Dark Blues level on points with Falkirk at the top of the table. "I brought in a fitness coach and I changed a few things in terms of ideas and the players bought into it," he explained. "We have a good group, we have some good quality but it's important to add to that. "There are loads of changes that I want to make and I'm sure the board will be right behind me. "I've been planning for the last eight to 10 weeks and we're not just scouring Scotland. We've been looking in England and further afield. "I've got players in mind and we are close to signing a couple. "Experience is important but I need quality. I need a product on the park. If we get that, the supporters will come back. "We want to entertain, we want to play a passing style and I want younger players with potential. "I look at Dundee United across the road and they got the lad (Andrew) Robertson from Queen's Park, so there are gems out there. "We're really hungry for success and the work all starts again now. I'll be at games on Tuesday, Wednesday and the weekend."